Astronomers of the US National Radio Astronomy Observatory (NRAO) have discovered the most massive neutron star ever seen. This discovery, made using the Green Bank Radio Telescope in West Virginia, has strong and wide-ranging implications across several fields of physics and astrophysics. "This neutron star is twice as massive as our Sun. This is surprising, and that much mass means that several theoretical models for the internal composition of neutron stars now are ruled out," said Paul Demorest of the NRAO. "This mass measurement also has implications for our understanding of all matter at extremely high densities and many details of nuclear physics," he added. Neutron stars are the extremely dense remains of massive stars that have exploded as supernovae. With all their mass packed into a sphere only a few kilometres across, their protons and electrons are crushed together into neutrons. A neutron star can be several times more dense than an atomic nucleus, and a thimbleful of neutron-star material would weigh more than 500 million tons. This tremendous density makes neutron stars an ideal natural "laboratory" for studying the most dense and exotic states of matter known to physics. The scientists used an effect of Albert Einstein's theory of General Relativity to measure the mass of the neutron star and its orbiting companion, a white dwarf star. The neutron star is a pulsar, emitting lighthouse-like beams of radio waves that sweep through space as it rotates. This pulsar, called PSR J1614-2230, spins 317 times per second, and the companion completes an orbit in just under nine days. The pair, some 3,000 light-years distant, are in an orbit seen almost exactly edge-on from Earth. That orientation was the key to making the mass measurement. As the orbit carries the white dwarf directly in front of the pulsar, the radio waves from the pulsar that reach Earth must travel very close to the white dwarf. This close passage causes them to be delayed in their arrival by the distortion of spacetime produced by the white dwarf's gravitation. This effect, called the Shapiro Delay, allowed the scientists to precisely measure the masses of both stars. "We got very lucky with this system. The rapidly-rotating pulsar gives us a signal to follow throughout the orbit, and the orbit is almost perfectly edge-on. In addition, the white dwarf is particularly massive for a star of that type. This unique combination made the Shapiro Delay much stronger and thus easier to measure," said Scott Ransom, also of NRAO. The astronomers used a newly-built digital instrument called the Green Bank Ultimate Pulsar Processing Instrument (GUPPI), attached to the GBT, to follow the binary stars through one complete orbit earlier this year. 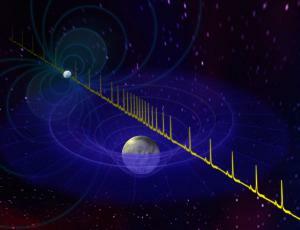 Using GUPPI improved the astronomers' ability to time signals from the pulsar several fold. The researchers expected the neutron star to have roughly one and a half times the mass of the Sun. Instead, their observations revealed it to be twice as massive as the Sun. That much mass, they say, changes their understanding of a neutron star's composition. Some theoretical models postulated that, in addition to neutrons, such stars also would contain certain other exotic subatomic particles called hyperons or condensates of kaons. "Our results rule out those ideas," Ransom said. Demorest and Ransom, along with Tim Pennucci of the University of Virginia, Mallory Roberts of Eureka Scientific, and Jason Hessels of the Netherlands Institute for Radio Astronomy and the University of Amsterdam, reported their results in the October 28 issue of the scientific journal Nature. Their result has further implications, outlined in a companion paper, scheduled for publication in the Astrophysical Journal Letters. "This measurement tells us that if any quarks are present in a neutron star core, they cannot be 'free,' but rather must be strongly interacting with each other as they do in normal atomic nuclei," said Feryal Ozel of the University of Arizona, lead author of the second paper. There remain several viable hypotheses for the internal composition of neutron stars, but the new results put limits on those, as well as on the maximum possible density of cold matter. The scientific impact of the new GBT observations also extends to other fields beyond characterizing matter at extreme densities. A leading explanation for the cause of one type of gamma-ray burst — the "short-duration" bursts — is that they are caused by colliding neutron stars. The fact that neutron stars can be as massive as PSR J1614-2230 makes this a viable mechanism for these gamma-ray bursts. Such neutron-star collisions also are expected to produce gravitational waves that are the targets of a number of observatories operating in the United States and Europe. These waves, the scientists say, will carry additional valuable information about the composition of neutron stars. "Pulsars in general give us a great opportunity to study exotic physics, and this system is a fantastic laboratory sitting out there, giving us valuable information with wide-ranging implications," Ransom explained. "It is amazing to me that one simple number — the mass of this neutron star — can tell us so much about so many different aspects of physics and astronomy."